In February, former globalist Trilateral Commission star Kenneth Juster became a member of the National Security Council. He had to resign from the Trilaterals, because they don’t allow you to have two masters at the same time. In just seconds he went from hugs for fellow traveler Madam Madeleine Jana Korbel Albright to shrugs for alleged swamp drainer Mr. Donald Trump. Not to be outdone for disappointing his supporters once by appointing Juster to high office, Trump struck again at the beginning of September with a new honor – nomination to be Ambassador to India, a job vacant since January 20. From 2010 until added to the Trump administration, Juster was Managing Director of the global financial firm, Warburg Pincus. which has massive investments in India. Does this mean Juster presents an immediate huge conflict of interest? 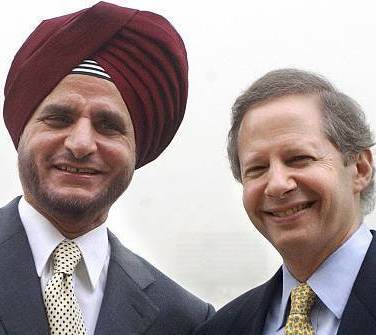 The Daily Beast asserts that Juster continues to have deep financial ties to Warburg Pincus, which has recently scaled up its investments in India. In June Reuters reported that Pincus et al would buy a 43 per cent stake in Tata’s engineering and design subsidiary in a $360 million deal. There are 30 publicly listed Tata enterprises with a combined market capitalization of about $130 billion, as of March 2017. Tata companies include Tata Steel, Tata Motors, Tata Consultancy Services, Tata Power, Tata Chemicals, Tata Global Beverages, Tata Teleservices, Titan, Tata Communications and Taj Group. Warburg has invested in 18 other Indian companies since 2007. These transactions have also raised the questions about conflict of interest for the Juster..
Juster previously served as the Chairman of the Advisory Committee of Harvard’s Weatherhead Center for International Affairs, the Chairman of Freedom House, the Vice Chairman of the Asia Foundation, and, last but not least, the Trilateral Commission. In the late 1990s I was a publisher, working for Journal Register Company (JRC), a Warburg Pincus conglomerate creation, that purchased Intercounty Publishing Company for $12.8 million. Intercounty became a division of JRC and I was continued as its publisher and CEO. I reported directly to the JRC president, the now late Robert Jelenic. I would not recommend such an experience to anyone, and assume the Warburg directors approved his actions at the time (see link above), and if not, they were negligent to the utmost.